Mothball sure loves his carrots. And he must beat humans to the carrot stash at all costs. When our adorable friend finds himself inadvertently running into a 'small humans' athletics carnival, delightful chaos breaks loose. Another absolutely adorable addition to the Wombat series by Jackie French and Bruce Whatley, readers will ooh and ahh over this warm fuzzball whose modus operandi is to eat, sleep and charm his human counterparts at every turn. 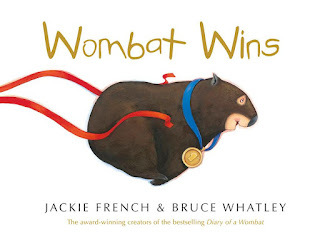 French's gorgeously 'dry' wombat voice is typically en pointe, and Whatley's action-packed illustrations and plenty of white page space beautifully carry another smile-curling story. My favourite scene is the head-hopping in the swimming pool--but every page is a true delight. Another story for all ages to love. I even love the typeface.